Moolamala pieces are all handmade with love, dedication and patience. Semi-precious stones and sacred seeds are selected and matched according to vibration and feeling. I use my intuition and follow my moods when making up a mala, and I treat my mala-making time as meditation, so some peace and grace probably goes into it at the same time. 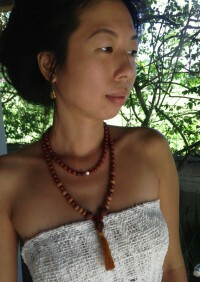 All mala can be worn as necklaces or wrapped around the wrist multiple times. 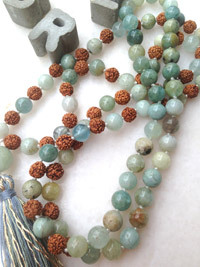 Each bead has its own structure and natural beauty, and some believe even healing properties – used for spiritual purposes in a mala, the crystals and rudrakshas become even more powerful reminders of what you wish to achieve in your life journey. They are equally for beauty and for mantra, and I leave it up to you to find how to use your mala!